We’re halfway through the 2018 NFL preseason schedule and rosters are starting to take form across the league. The 2018 NFL Draft has already starting paying dividends, as noted by the grades from some of the first-round draft picks already. Second-year cornerback Sidney Jones was the Eagles’ highest-graded defensive player at 86.7 overall last week, breaking up three passes in coverage despite allowing four catches and a touchdown on seven targets. He played some on the outside but was the starter in the slot, where Patrick Robinson emerged last year in Philadelphia. Jones, a second-round pick last year, missed almost all of 2017 with a torn Achilles, but he’s starting his second season off on the right foot with a strong preseason. Head coach Hue Jackson has been adamant that Tyrod Taylor is the Week 1 starter in Cleveland, that much is certain. However, it’s no secret Baker Mayfield is the future of the Cleveland Browns, and if recent history is any indicator, he’ll see the field at some point this season. 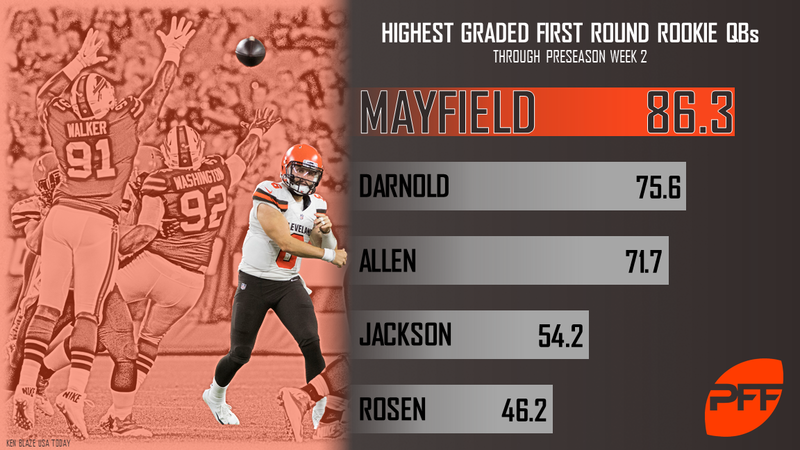 Mayfield has been as advertised through the first two weeks of preseason, earning overall grades of 80.2 and 83.4. His passing grade of 84.9 is fifth among 84 qualifying quarterbacks with at least 10 dropbacks, and the highest among rookies. While admittedly a small sample size, if Mayfield can continue his strong preseason, it won’t be a surprise if the first overall pick sees the field sooner than later. Broncos’ 2018 third-round pick Royce Freeman and once-promising Devontae Booker were offseason favorites to lead the team in touches. In the past two weeks however, Freeman and Booker have played 22 and 17 total snaps, respectively. Of the 131 total running back touches played, seventh-round pick David Williams leads the way with 43 snaps, undrafted rookie Phillip Lindsay has seen 27 and second-year player De’Angelo Henderson 22. It’s a safe bet to assume the matchup with the Redskins on Friday night will have a sizeable impact on the results of the competition. AP in the mix at RB for Washington? Former All-Pro RB Adrian Peterson has signed with Washington and will compete for carries in the Redskins’ backfield. 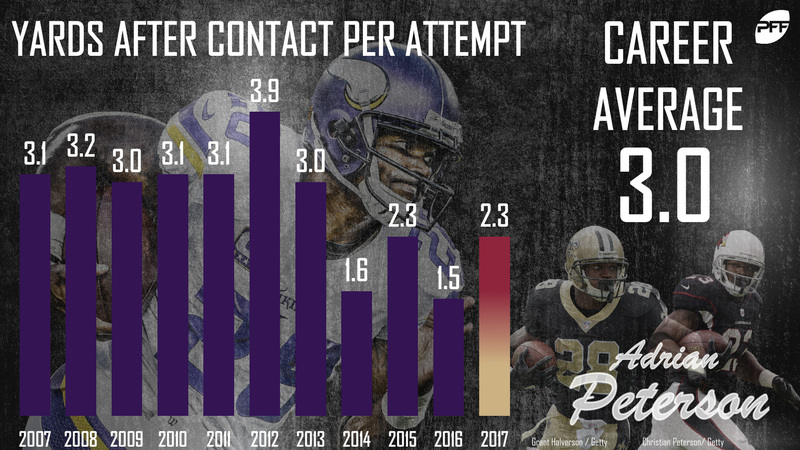 Peterson hasn’t earned a 67.0-plus PFF grade in four years and had his third-worst mark (51.8 overall grade) of his career last season. He joins a backfield that has been dominated by Rob Kelley and Kapri Bibbs following the Derrius Guice injury in the Redskins’ first preseason game. With Samaje Perine out for at least a week with an ankle injury, the door is open for Peterson to make an immediate impact. 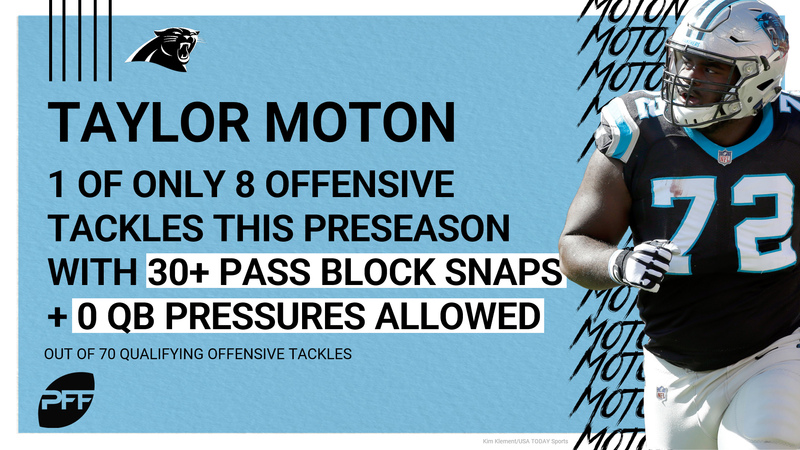 Taylor Moton has yet allow a QB pressure this preseason over 36 pass-blocking snaps and his overall grade of 83.6 ranks fifth overall among qualifying tackles. With 2017 2nd-Team All-Pro, Daryl Williams likely to begin the year on the injured reserve, how Moton performs in his absence will likely determine this offensive line’s success in 2018. The former second-round pick has looked great the last couple weeks both in pass protection (84.0 grade) and on run-blocks (81.2). A season ago, Derek Rivers was the Patriots’ first pick of the 2017 NFL Draft (83rd overall) but was lost for the season after playing just 36 snaps in the preseason. He’s made his presence known already this season however, as he leads the team with nine QB pressures this preseason while his pass-rush productivity of 12.5 ranks 18th among edge defenders. The Patriots’ defensive pressure percentage of 33 percent ranked 25th in the league last year and Rivers can likely earn quite a bit of playing time with another big showing on Friday night. QB controversy with the Jets? Sam Darnold was drafted to be the face of the franchise for the Jets, but Teddy Bridgewater’s performance this preseason has people wondering if he can steal the starting job for now (or whether he’ll be traded due to his rising stock). After two preseason games, Bridgewater has an overall grade of 85.1, ranking fourth out of 46 quarterbacks. Darnold has an overall grade of 75.6, ranking 10th. The two aren’t very far off from each other on several statistics, however on Bridgewater’s 12 pressured dropbacks, he’s completed 8-of-9 attempts for 79 yards, one touchdown and no interceptions, good for a passer rating of 140.3. On Darnold’s 11 pressured dropbacks, he has completed 5-of-6 attempts for 43 yards, no touchdowns and one interception, giving him a passer rating of 47.6. Bridgewater’s continued success will either leave the Jets with a battle of two competent quarterbacks, or an even higher trade value, if they were to choose to do so. After earning an overall grade of 34.7 in the first preseason game and ranking last among qualifying quarterbacks, Davis Webb redeemed himself with a good performance against the Lions in Week 2. Webb was given an overall grade of 78.5 in the second preseason game, ranking second among quarterbacks with at least 20 snaps last week. He was strong when given a clean pocket, as he completed 11-of-14 attempts for 121 yards, one touchdown and no interceptions but will need to improve his accuracy, as he has a 66.7 adjusted completion percentage this preseason, ranking 27th of 37 quarterbacks. The Lions took Kerryon Johnson in the second round of the 2018 NFL Draft this past April, and the early returns have been positive. Through the first two preseason games, Johnson has played 56 snaps and has an overall grade this of 78.5 that ranks tied for eighth at the position. On his 16 touches so far, Johnson has avoided five total tackles, and 30 of his 43 rushing yards have come after contact. With the third preseason game serving as the regular season “dress rehearsal,” Johnson has the chance to distance himself from LeGarrette Blount as the Lions primary back. Another second-rounder out of Auburn, Carlton Davis didn’t play this past Thursday for the Buccaneers due to an ankle injury. With Vernon Hargreaves out, and fellow 2018 second-rounder M.J. Stewart going down with injury last week, Davis could make up for lost time. In his preseason debut, Davis played 41 snaps including 23 in coverage. He allowed 0.91 yards per coverage snap in that game, almost mirroring his final season’s number where he allowed 1.01. With injuries aplenty in the Tampa secondary, the Bucs could need Davis as a key contributor early in his rookie season. Vikings LB Eric Wilson is a player to watch in this one as he’ll be looking to build on back-to-back strong performances to start the preseason. The 2017 undrafted free agent out of Cincinnati has earned an overall grade of 90.9 through two games, ranking fourth out of 154 linebackers to play at least 30 snaps. Wilson did not play a single snap in the regular season last year on defense, but excelled on special teams, earning a grade of 89.4 which ranked fourth in the league. While LB Ben Gedeon is still the likely favorite to start at weak-side linebacker, Wilson is certainly making a push for more playing time come the regular season. The Seahawks signed WR Jaron Brown this offseason to a two-year contract worth $5.5 million. Last week against the Chargers, Brown was targeted twice, catching both targets for 74 yards including a 45-yard deep pass completion from QB Russell Wilson. After WR Doug Baldwin, who has led the team in targets the last four seasons, the second option in the Seahawks passing game remains unclear heading into 2018. WR Tyler Lockett has played just 11 snaps this preseason and is coming off a disappointing 2017 where he saw a career-low grade of 67.3 on the back of a career-high percentage of snaps played (64.8 percent). With Lockett now dealing with a toe injury, we’ll see if Brown can continue to impress this week against Minnesota in an attempt to push for the second wide receiver spot. As it stands right now, among the league’s receivers with at least two targeted passes this preseason, the Packers have three wide receivers who have graded out in the top 15 in overall offense grade. Davante Adams has produced the league’s top offense grade at the position this preseason with a 92.5 while rookie Marquez Valdes-Scantling and Jake Kumerow have each produced identical 85.6 marks. Kumerow leads all receivers with 190 receiving yards this preseason as Green Bay may have found their next stud at the position as they attempt to fill the void left by Jordy Nelson’s release this offseason. Maurice Hurst exploded in his second game for the Raiders, tallying a 75.4 overall grade after just a 45.6 overall grade in his first appearance. Despite the inconsistency to start his preseason, he has, not shockingly, impressed with his pass-rushing skillset. Hurst has accumulated a 76.6 pass-rush grade across 28 pass-rushing snaps, good enough to rank 15th among interior defensive linemen with at least 20 snaps this preseason. Another strong performance will undoubtedly do wonders to his overall preseason grade, and his playing time come the regular season. After trading Alex Smith this offseason, the Chiefs put their team in the hands of former first-round selection Patrick Mahomes. Through the first two preseason games, Mahomes has shown flashes of brilliance, coupled with a few questionable decisions when throwing the ball and has led to one of the league’s top moments from this preseason but also only a 50.7 overall grade that ranks him 51st out of 64 quarterbacks with at least 20 dropbacks this preseason. Bears first-round pick Roquan Smith ended his holdout and is tentatively expected to make his preseason debut on Saturday night, although a recent hamstring injury might prevent that from happening. Smith ranked as the seventh overall prospect on our final 2018 NFL Draft big board after he finished with the second-highest grade among inside linebackers in college football in 2017. Smith was a force against the run as his 13.0 run-stop percentage ranked ninth best among 196 qualified inside linebackers at the FBS level last year. For the first time this preseason, Texans quarterback Deshaun Watson will have his top two weapons in the lineup, as starting wide receivers DeAndre Hopkins and Will Fuller will make their debuts. When Watson was healthy through the first eight weeks of last season, Hopkins ranked fourth among qualified wideouts in yards per route run with a mark of 2.33 and Fuller ranked ninth with a mark of 2.15. Safety Tyrann Mathieu is also expected to see his first action as a Texan against the Rams. Mathieu, who signed with Houston this offseason, posted a defensive grade of 72.6 with the Arizona Cardinals in 2017. When the Rams drafted tackle Joseph Noteboom in the third round of the 2018 NFL Draft, he was tasked with learning and developing behind Andrew Whitworth, one of the best tackles to play the game. Through two preseason games, he looks ready to go sooner than later. Noteboom has played in 41 pass-blocking snaps across two games and has yet to allow a single quarterback pressure. That mark is tied for second most pass-block snaps played without allowing a quarterback pressure among tackles this preseason. This week he will go up against a Houston defense that has generated the fourth-highest cumulative team pass-rushing grade (76.7) this preseason, facing a stiff test in his growth. 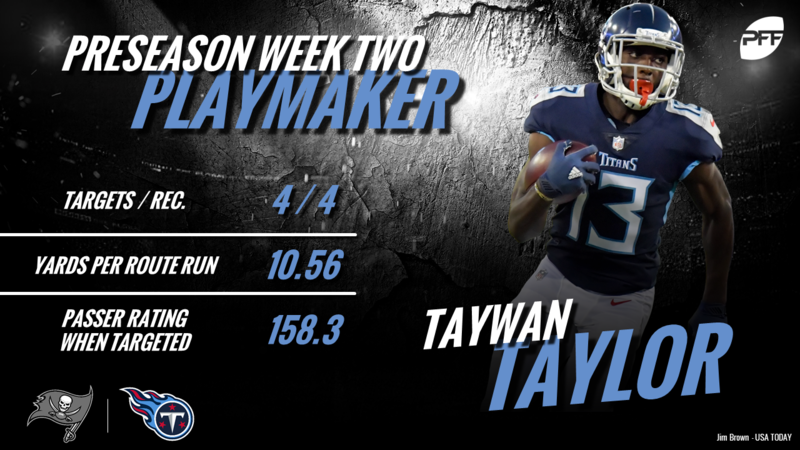 Second-year wide receiver Taywan Taylor turned heads throughout training camp and is now emerging as another weapon for the Titans’ offensive attack. Last week, Taylor showed off his burst with four catches, 95 yards, and two scores on only 22 snaps, and his 10.56 yards per route run ranked first among qualifying receivers over the course of the weekend. Through two preseason games, Taylor has produced a perfect 158.3 passer rating when targeted and earned a receiving grade of 81.9, including the top overall receiving grade in Week 2 at 90.9. With another impressive showing with the first-team offense, Taylor could be on his way to a breakout 2018 season. 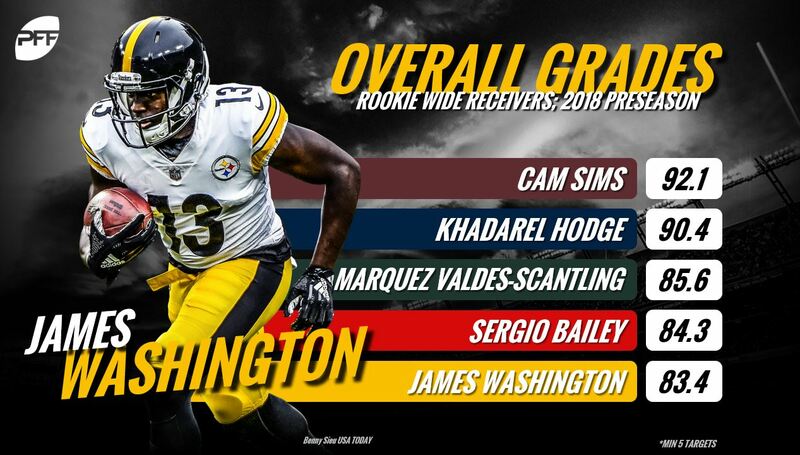 James Washington has made the most of his preseason opportunities so far for the Steelers. Washington is fresh off the heels of a five-catch, 114-yard, two-touchdown performance in Week 2 of the preseason that earned an 88.2 overall grade. Over two preseason games, the rookie wideout has generated 3.04 yards per route run and a 146.8 passer rating when targeted. Currently sitting behind Antonio Brown and JuJu Smith-Schuster on the depth chart, Washington could earn more work in multiple receiver sets with another impressive showing against Tennessee. We saw evidence last week of the early news out of camp that a strong connection between Jimmy Garoppolo and ‘secret superstar‘ Marquise Goodwin was forming. In last week’s preseason game, the duo teamed up for three catches in as many targets for 61 yards, giving Goodwin a solid 6.10 yards per route run. With these two emerging as leaders on offense, it’ll be imperative they carry this chemistry throughout the preseason and into September. The Colts are giving their young pass-protectors as much experience as they can this preseason. With Quenton Nelson (41) and Braden Smith (45) both playing significant pass-blocking snaps in their first two games. Nelson owns a 58.1 pass-block grade thus far but has only allowed two quarterback pressures while Smith, who’s transitioning from guard to right tackle, has registered a 63.2 pass-block grade yielding three total pressures. With the protection of Andrew Luck being paramount for this Colts coaching staff, getting Nelson and Smith ready to play Week 1 of the regular season is definitely on the top of the priority list. Undrafted right guard Jesse Davis is entering his first season entrenched as the Dolphins’ starter, and has stood out so far. Davis earned an 82.4 pass-blocking grade in his last preseason game against the Panthers, playing 30 snaps while not allowing a single pressure. Next to Josh Sitton, the Dolphins should feel comfortable about their starters at the guard positions for the upcoming season. On the other side of the ball, newly-acquired Robert Quinn made his presence felt against the Panthers generating an 88.0 pass-rushing grade. In just 13 total defensive snaps, Quinn logged two sacks and one hurry along with two run stops. The former Ram should provide a much-needed boost to a defense which finished with just 30 sacks last season. Terrell Suggs isn’t getting any younger, but the Ravens have themselves two effective pass-rushers waiting in the wings. Za’Darius Smith and Tim Williams have been very active in the preseason, ranking first and sixth in pass-rushing productivity among edge players with at least 35 pass-rushing snaps, respectively. Smith has racked up 10 total pressures on just 36 pass-rushing snaps while Williams has collected 12 total pressures on 76 total pass-rushing snaps. 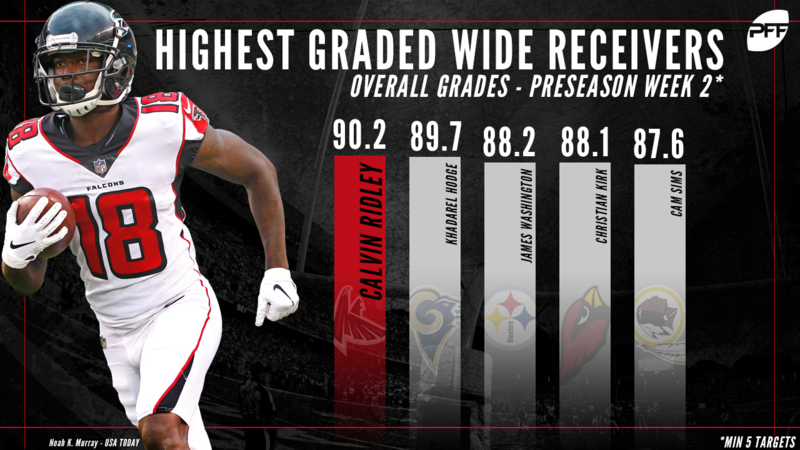 As the Falcons’ first-round pick, the expectation has always been that Calvin Ridley would see time as a starter in his rookie season. Based on his preseason performance so far, it will be a surprise if Ridley isn’t the immediate third wide receiver in 11 personnel groupings. Just last week, Ridley’s 90.2 overall grade was the highest among 22 wide receivers who saw at least five targets. With Julio Jones not expected to play against the Jaguars, Ridley should face a strong test against the top-notch Jaguars secondary. The Jacksonville official depth chart currently lists Keelan Cole as one of the Jaguars’ starting wide receives along with Marqise Lee with Dede Westbrook, Donte Moncrief and D.J. Chark behind them. So far this preseason, Westbrook leads the way with 58.3 percent of snaps coming from the slot, versus 44.4 percent for Cole. They would appear to be most likely compete for snaps inside as Moncrief and Chark have yet to run a route from the slot this preseason and the rest of the Jacksonville receivers’ usage suggests that Lee and Moncrief will ultimately be the outside wide receivers. Moncrief’s 73.1 receiving grade through two preseason games leads the above group of Jaguars wide receivers, followed by Westbrook’s 69.7, Lee’s 57.7, Chark’s 56.5 and finally Cole’s 52.1. Will Clapp and Ryan Ramczyk had great performances for the Saints in the second preseason game as both made the PFF team of the week. Clapp, who played at right guard and then center in the game, didn’t allow a single pressure on 26 pass-blocking snaps and he also did a solid job on running plays, earning a run-blocking grade of 72.4. Ramczyk earned his spot on the team of the week by way of run-blocking, as he earned a massive 97.4 run-blocking grade for the game, ranking first among all offensive tackles. One of the biggest positives of Derwin James coming out of Florida State was his versatility, something that has been on display so far this preseason. In two games, James has logged 64 snaps, 24 of which have come at linebacker, nine at cornerback and 31 at safety. With a seemingly endless supply of injuries for the Chargers’ defense, James’ versatility could start to pay dividends sooner rather than later. He has earned an overall grade of 72.6 after two games, tied for 34th out of 146 safeties with at least 30 snaps this preseason. The battle for the backup quarterback job continues in Cincinnati, and the name to watch is Jeff Driskel to see if he can continue his strong preseason. Driskel played 29 snaps last week, the most of all the Bengals‘ quarterbacks, and he posted the highest overall grade at 81.8, which was the third-highest offensive grade last week. Matt Barkley rang the bell at a 68.6 overall grade. If Driskel continues to shine, the decision for the backup quarterback will get tough for Marvin Lewis. Josh Allen has had garnered most of the attention this offseason in Buffalo, and last week against the Browns, he flashed brilliance, while also having some down moments. His overall grade of 68.5 ranked 38th among 95 quarterbacks in the second week of preseason, and in the real preseason test of Week 3, fans will be monitoring how he fares against the Bengals. Allen was solid when blitzed last week, completing 3-of-4 passes for 17 yards and a touchdown for a passer rating of 121.9. The Cardinals’ receiving corps underwent a much-needed overhaul this offseason. While 15-year veteran Larry Fitzgerald opted to stay one more year with the team that drafted him back in 2004, other pass-catchers like Jaron Brown, John Brown and Brittan Golden all found their way out of town. Their exit created a need for a young receiver to step up, and second-rounder Christian Kirk and second-year pro Chad Williams have both made their case to be named the No. 2 WR. Kirk has already amassed a PFF grade of 76.1 through two games, after catching 6-of-8 targets for 58 receiving yards and a touchdown, and his passer rating of 134.4 when targeted is the 13th-best mark among players at the position. His counterpart, Williams, will enter the regular season ‘dress rehearsal’ against Dallas with a 70.8 overall grade. Where does Dallas go behind Frederick? With news breaking about Travis Frederick’s inability to play and his indeterminable timeframe for a return, the Cowboys are forced to turn elsewhere this season at the center position. Joe Looney has taken the majority of snaps at center this preseason, logging 117 so far through two games. His 56.0 overall grade ranks 61st at the position, among centers with at least 10 snaps. He’ll have to improve vastly to reach levels anything close to Frederick, who has never graded below 85.4 overall in his career.